Here is the Siset 023 Stamp Set mentioned in Poll-1. I do love stamp sets with sentiments, and ones that highlight different words in the sentiment to provide emphasis for the main message. This Siset023 one even has a few sentiments with images that allow you to customise your cards with decorative accents. Did you know you can cut words apart that are joined together into single stamps? Sometimes you want to combine words that are there with other ones to spell out your own messages. You can even combine them with other stamp sets when you cut them into single words. Another way to achieve the same effect without cutting into them is to colour specific parts of a stamp with Stampin' Write! markers. I often use a mask over the area the rest of the stamp will press into though, in case I get a shadow image from the uninked words. This method also allows you to change your ink colours to highlight whole or parts of words. I also use sentiment stamps on gift tags, on scrapbook pages, in journaling projects, on envelopes, to make special messages ot add to my husband's or children's lunch boxes, to make little memory cards to stick up on the computer to encourage someone, and for any other occasion where a sweet word would help. Another advantage of these acrylic Siset023 sorts of stamp sets is that you can bend the images a bit before mounting them on your acrylic blocks so you can have a curvy sentiment instead of a straight one. This works especially well when you have the words in one straight line already. The paragraph sentiments are harder to bend, but you can skew them a bit. Remember you can also use partial stamps when you are going for a mixed-media look. Just unevenly ink one up, or run it off the page, or mask off an area where you plan to put something else. Some of my ATCs show techniques like this. Sometimes I put half a sentiment on the front of a card and the other half of the message inside the card. 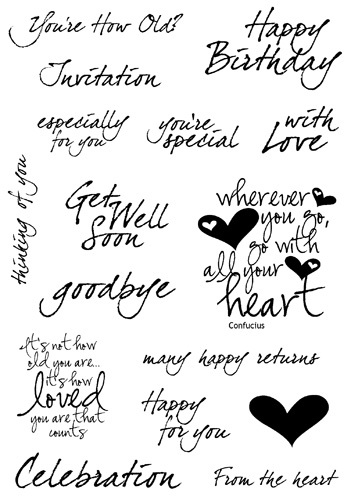 For example, I might put 'Get Well Soon' on the front of my card, then 'thinking of you' on the inside. I also cheat and write my own message inside the card, or add hand written extra words to a message. Sometimes you can't find a 'belated' stamp, for instance. I just add a Happy Birthday stamp and take a marker, add an arrow between the words and write 'belated' at the top! He he. I hope you enjoy using the Siset023 set and many others like it!